A 7 Days Gorilla Safari Adventure including wildlife viewing, and primates tracking tour in Rwanda and Uganda starts and ends in Kigali. 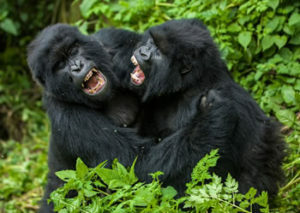 After gorilla trekking in volcanoes, travelers can choose to go for chimpanzee trekking/ canopy walk in Nyungwe forest, and boat cruise on Lake Kivu or else connect to Lake Bunyonyi for canoeing and game viewing in Uganda’s Queen Elizabeth national park. 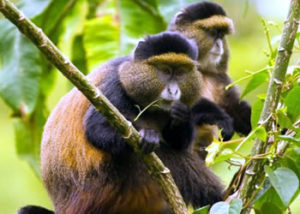 Day 3: Golden Monkeys tracking / Dian Fossey hike & transfer to Lake Kivu or cross to Uganda and stay at Lake Bunyonyi. Day 1: Airport Pick up. On arrival, our representative will welcome and transfer you to Volcanoes National park. 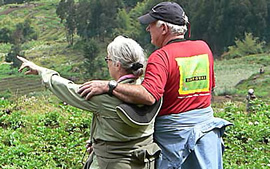 You will enjoy a spectacular scenic view of the Virunga Mountains en route. Dinner and overnight stay at Mountain Gorillas view Hotel/ 5 Volcanoes Lodge (Luxury)/ Da Vinci Lodge, Gorilla Solution Lodge, Le bamboo Lodge (Deluxe)/Muhabura Hotel (Budget). Day 2: Gorilla Tracking Adventure & Ib’iwachu Cultural Village. Day 3: Dian Fossey Hiking. 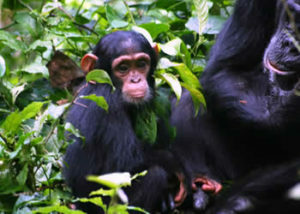 Day 4: Transfer to Nyungwe Forest or Kibale Forest National Park (Uganda). Take breakfast and transfer to the park headquarters for a briefing by the park warden. Begin the forest hike along with other visitors and park rangers following trails to the colobus monkeys. In the alternative, a canopy walk is another highlight worth undertaking. Dinner and overnight stay at Nyungwe Forest Lodge (luxury)/ Nyungwe Top View Lodge(Deluxe)/ Gisakura Guest House (budget In case you opt for Uganda, a game drive in the park and a boat cruise along the Kazinga channel will be a big highlight and overnight at Mweya Safari Lodge (luxury)/Park View Safari Lodge(mid-range)/Enganzi Lodge (budget). Day 7: Kigali city tour and Departure. 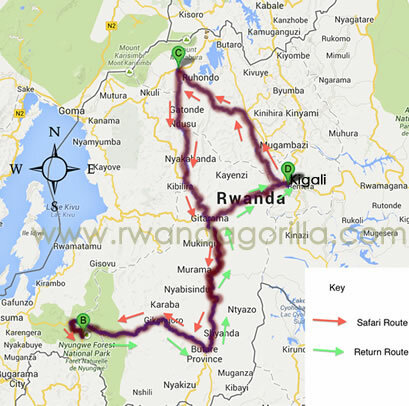 Enjoy your breakfast and drive back to Kigali for your scheduled flight back home. Visit Murambi Memorial, Nyanza palace or Butare Museum en route. In case you are to travel the following day, a city tour that includes visiting the handicrafts market and Gisozi genocide site would be optional.